Dating back to 1972, Anchor Porter is one of the longest surving dark American beers on the shelf today. Like all of the old-school Anchor brews, this is a beer that helped define the American version of its style. 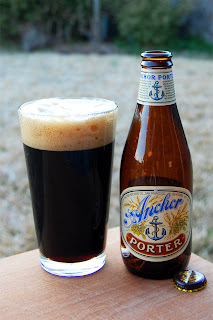 Anchor call this the definitive American Porter, and I have to agree with them. With deep black color, a thick, creamy head, rich chocolate, toffee and coffee flavors, and full-bodied smoothness, Anchor Porter is the epitome of a handcrafted dark beer. It's definitely Porter weather outside, so let's dive in to a classic. Appearance: A dark brown, essentially black body with laser beam ruby-red highlights. Up top, there’s about two fingers of creamy tan-tinged head that feature great retention and lacing. Aroma: Sweet toasty malt accompanied by mild notes of chocolate, dark fruit, and creamy lactose. Taste: A sturdy roasted malt backbone with notes of chocolate, coffee, mild spice, and dark fruit. Bitter coffee-ish notes and a good dash of lactic notes cut the malt nicely. Roasted malt and dark fruit in the aftertaste. Mouthfeel: A smooth and creamy medium body with good carbonation. The finish dries just a little. Drinkability: This is a smooth drinker and a brilliant session choice. Verdict: Anchor Porter is tasty, highly drinkable, and a perfect example of the American Porter style. While it may not be absolutely bursting with flavor, it’s solid and expertly crafted, like every other Anchor beer.